Yesterday marked eight years since Glen and I said "I do." We celebrated by taking Dan and Monika to Dairy Queen for lunch. We always do something special on our anniversary, and after several disappointing meals at fancy restaurants, we've settled on an anniversary tradition of dining at DQ. No one is disappointed with their meal, the kids can come along and, since it's usually a lunch date, we don't have to hire a relief milker. The other anniversary tradition I maintain is jotting down the happenings of the past year in an anniversary book we received as a wedding gift. I'm always amazed at how much happens in a year. And I always find myself thinking during the process, "Whoa, who'd have thought, eight years ago, that we'd be right here in this place at this time?" That thought went through my head as we sat in the Dairy Queen in Sauk Centre. Dan had chocolate ice cream dripping down his chin. Monika had tears running down her cheeks because she wanted a chocolate ice cream cone of her own and wasn't allowed to have one (the stuff stains worse than cow manure; I did share some of my ice cream with her). Glen and I just sat there and grinned as we wiped away tears and chocolate ice cream. We were quite the sight, but what I hope the curious onlookers saw was the happiness in our little family. We have been abundantly blessed these past eight years. And that's worth celebrating every day. The girls are going to Expo! The girls (e.g. 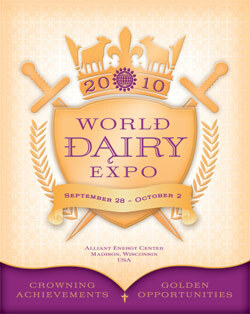 our cows) are on their way to World Dairy Expo. No, we didn't all-of-a-sudden start exhibiting cattle. The ladies aren't riding to Expo in a trailer. They're going as part of the Dairy Star's new display, which will be unveiled tomorrow morning. A photo featuring Charlotte, Daphne and Tudie is a central part of the display. 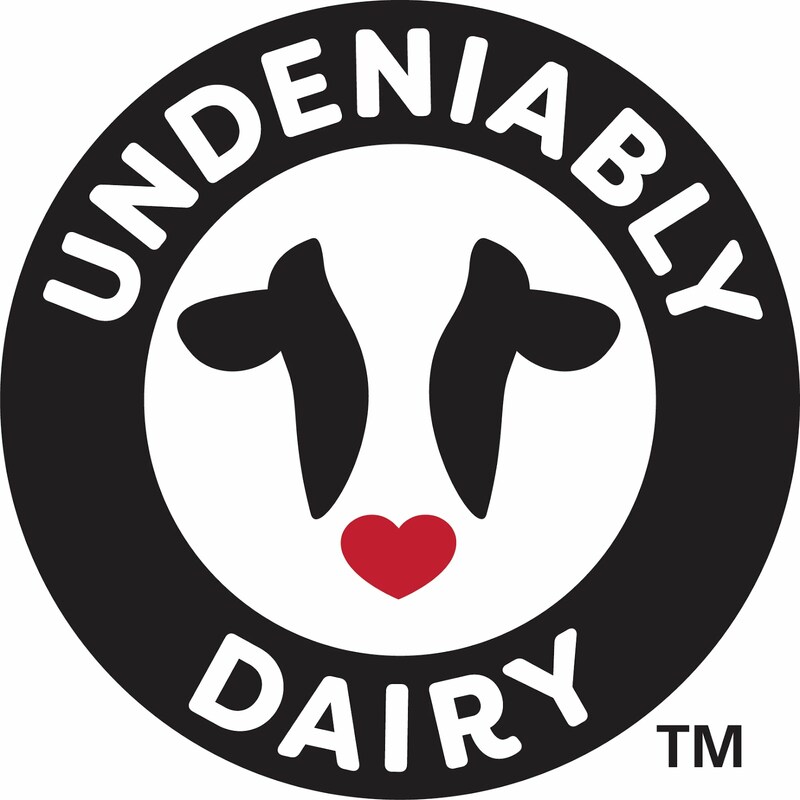 The folks at the Dairy Star wanted a photo of cows in a pasture, so they asked if they could come out and take some pictures. I got to see a mock-up of the display last week and, honestly, it was pretty cool to see our ladies right up front. It's been nearly 10 years since I've been to Expo, so, needless to say, I'm really looking forward to this "work". And, finally getting to see our ladies on display. If you're heading to Expo, stop by our booth (#MC 34, which is on the Main Concourse in the Coliseum). I'll be there Thursday, Friday and Saturday. I'll be the one with the big smile on my face. This is the barrier we constructed to hide our acid and detergent barrels. As far as physical barriers go, this design will not keep children out. But it does provide a good visual barrier. And since the "out of sight, out of mind" principle works well with young children, we've found that this barrier does what we wanted it to. 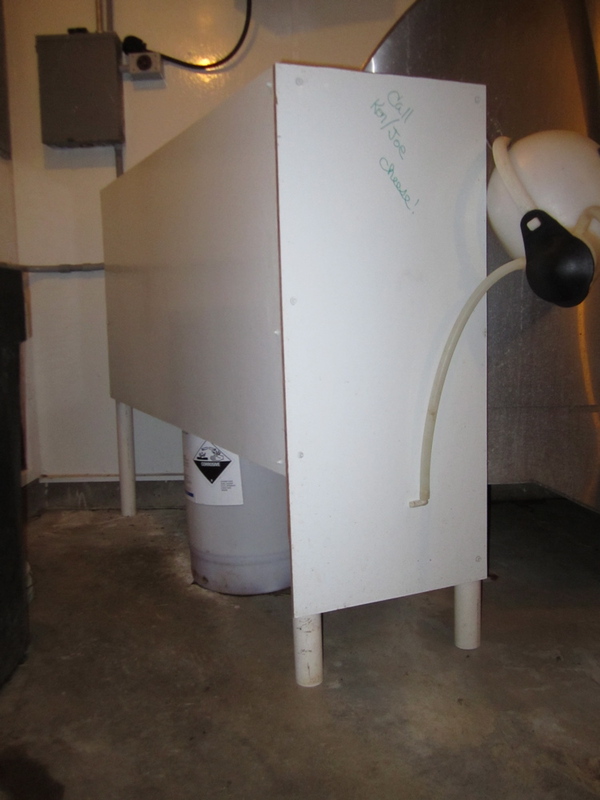 Between the barrier and the child-resistant drum pumps we now use, our milkhouse chemicals are a lot more inaccessible than they used to be. I also save all of the child resistant caps off of gallon jugs and use them to replace non-child resistant caps on other jugs. 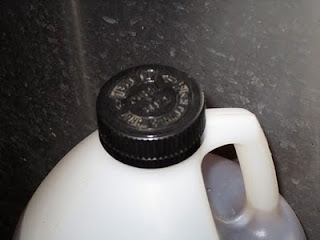 For example, our utensil soap comes with these caps, but one of the stronger cleaner-santizers we use comes with a regular cap, so I replace the cap with a child resistant cap from an empty soap jug. Other products that are often left at ground level – like mineral oil, propylene glycol and oral calcium – get child resistant caps, too. I hope you had a safe week! 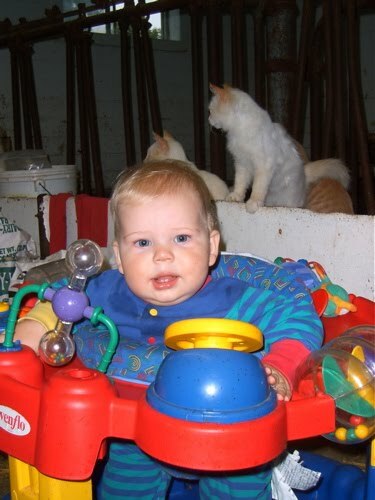 We have heard several stories this year about small children having unfortunate encounters with milkhouse chemicals. After hearing these stories, we decided it was time to invest in safer pumps for the chemicals on our own farm. We replaced the old pumps in our acid, detergent, pre-dip and post-dip with Ezi-Action Drum Pumps. These pumps are equipped with very child-resistant anti-pumping safety straps. 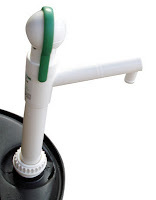 The pumps are also easy to use and have a self-draining spout, so no residual fluid is left in the spout. Because we like these pumps so much, we're giving away two Ezi-Action Drum Pumps (donated by our milking equipment dealer, Champion Milking Systems of Albany, Minn.). To enter the drawing, email your name, address and phone number to gsfrericks[at]meltel.net (replace the [at] with @). To qualify for the drawing, you must be a dairy farmer and your entry must be received by midnight on Monday, October 4. The drawing will be held, and winners notified, on Tuesday, October 5. 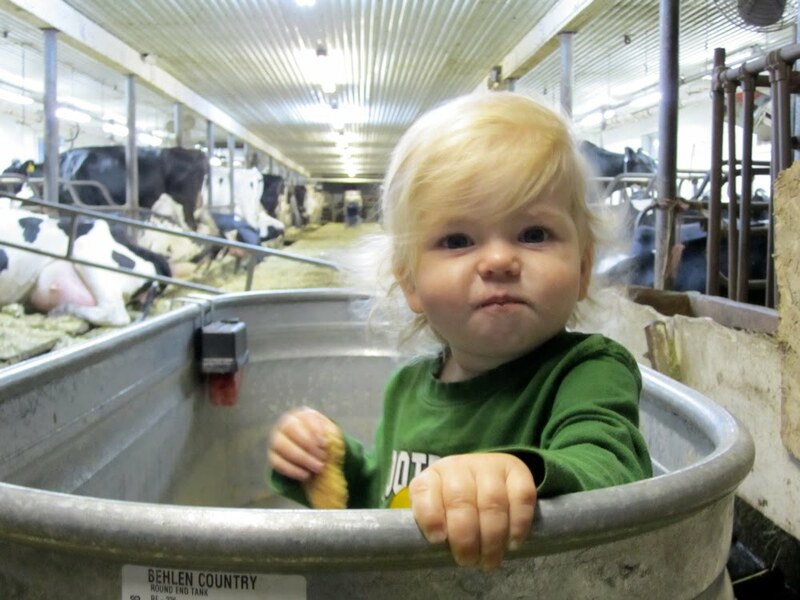 As a farming mom, one of my constant responsibilities is keeping our children safe on the farm. 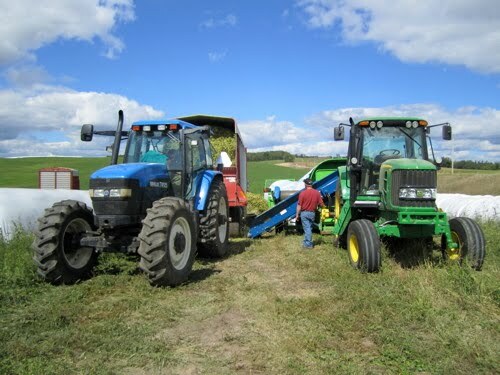 Since this week is National Farm Safety Week, I'll be posting about farm safety all week. It seems like all of the safety advice we read about is common sense, but I still think it's a good idea to review the information from time to time, especially if you have children whose skills and abilities are rapidly changing. We tend to become accustomed to the risks associated with routine chores and can easily overlook just how dangerous some of those situations could be to our pint-sized helpers. 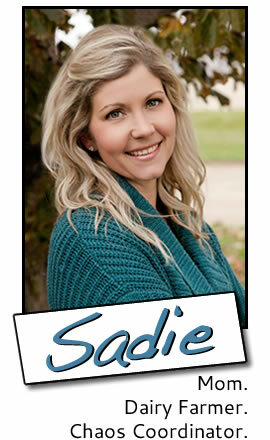 These sites have good information on farm safety for children, adolescents and adults. To me, some of the advice seems impractical — like making sure adolescent employees change their outer clothes after working with large animals — but most of the advice is sound. 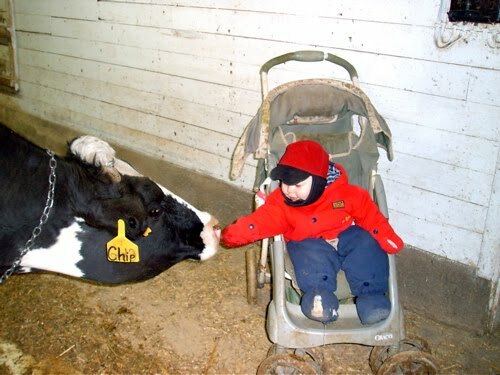 I'd also like to know... What do you do to keep your children safe on your farm? Woo-hoo! 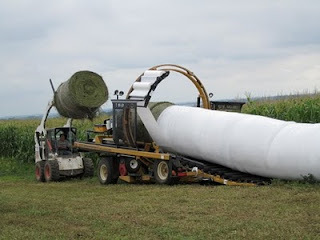 The corn silage is done! 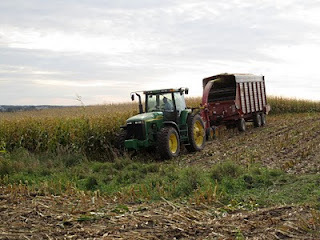 The guys finished chopping corn silage just as I was starting evening chores, which meant they finished several hours ahead of schedule. Later, when we were in the barn together, Glen was acting so squirrelly that I asked him if maybe he'd had a bit too much caffeine over the course of the day. I think tomorrow will be nap day. 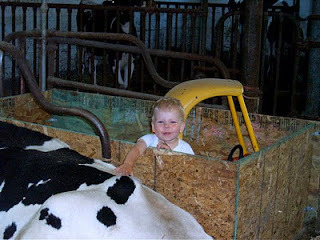 In addition to strollers, swings, car seats and saucers, our kids have also been kept safe outside in playpens, stock tanks (empty, of course), and a pen we built with plywood in an empty stall (before the barn was full). 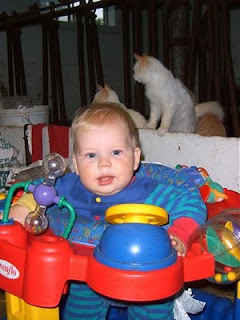 We keep some easy-to-clean toys in the barn, too. 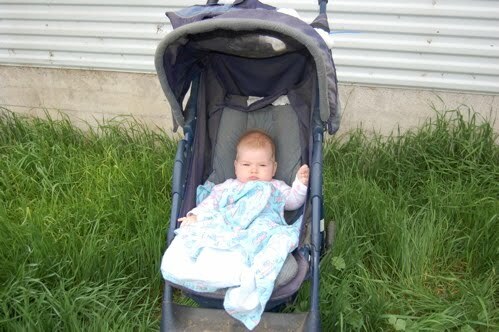 Most of the time, they were in strollers, because strollers can be pushed around to wherever the action is – lots of times in the center aisle of the barn – or, in the case of the photo below, outside by the barn while we were trimming hooves. When Dan and Monika were infants, I also kept a front carrier in the barn and would do calf chores and such with them strapped to my chest. It seemed like they weren't content for very long in one place, so I would move them around from stroller to swing to carrier and so on. One farming mom I know limited her kids to either the saucer or the stroller, because you can spend a fair bit of time moving children once they learn that fussing will get them moved. Limiting the number of options limits the fussing. As far as eating things goes, both Dan and Monika were walking before I "let them out of the stroller". By that age, not as much goes into their mouths. But, Monika still does put some stuff in her mouth, most of which she spits out and a little of which she swallows. I've learned to just look the other way. Most of the stuff in Monika's play area is relatively harmless (corn, oats, bits of hay and straw, etc. ), and ingesting a few germs is good for kids' immune systems, at least in my opinion. Glen and I had our first disagreement on Friday over whether a cow should be saved or salvaged. Geneva was down with a case of milk fever late Thursday night. She was overdue and obviously close to calving, so, thankfully, we had been checking on her frequently. She got up after two bottles of intravenous calcium. Glen checked the position of the calf and found that it was still unengaged. We brought her in from the pasture so we could watch her more closely. On Friday morning, Geneva was starting to show signs of labor (discharging, etc.). When nothing more had happened by late afternoon, Glen palpated her again to check the position of the calf and immediately called the vet. Geneva's uterus had twisted. (It wasn't twisted Thursday night.) We had heard stories of such cases, but hadn't experienced one until now. Dr. Kevin arrived within minutes. A short while later, a beautiful, but dead, heifer calf was delivered. And, then, as if that wasn't enough to make for a bad day, Dr. Kevin found a large tear in Geneva's uterus during his post-delivery exam. In four years of working with Dr. Kevin, I've never heard him explain the seriousness of a situation so clearly. We had three options, as he put it. If we did nothing, she would die within days from peritoneal infection. We could immediately try to salvage her. Or we could try to stitch up the uterus (blindly, via the cervix) and start her on an aggressive course of antibiotic therapy. There was a lot of uncertainty about whether the repair and treatment would work, and she would most certainly never reproduce again. Dr. Kevin did say he'd done such a repair on one other cow and she had survived, but the first couple weeks were rough. Glen wanted to try to keep Geneva. He has a terribly hard time losing cows and maintains that as long as the cow keeps trying, he'll keep trying. Glen checked for himself to see how big the tear was and came up with the idea of repairing the uterus from the front, through an incision in the right side of her abdomen (much like a DA repair or C-section). Dr. Kevin thought it would probably work, at least to stitch up the front of the uterus. He thought he probably wouldn't be able to reach the back of the tear, and would have to stitch that through the cervix. I conceded and the surgery began. Glen held the trouble light, Dan and I watched, Monika napped in the stroller, and Dr. Kevin scrubbed, sliced and stitched while Geneva stood there. Dan asked questions the entire time, the best of which was, "Dr. Kevin, is she going to die?" To which Dr. Kevin replied, "Well, I sure hope not." To everyone's surprise, the repair went extremely well. Dr. Kevin was able to stitch the entire tear from the front. When it was all done, it looked just like Geneva had DA surgery. We gave her pain killers and antibiotics and crossed our fingers. Later that night, when Geneva refused to eat anything — not even calf starter — or drink, the challenge ahead of us finally became apparent to Glen. I told him flunixin wasn't enough for her pain; she needed morphine. But that's not an option for cows, so he drenched her instead to at least keep her hydrated. Time will tell for Geneva, but I have a feeling some of these questions might never be answered. "Whoa! Where did the day go?" That quote about sums up how I've felt for the past three weeks. It seems like the end of August slammed right into the start of September and left my head spinning. I'm trying to catch up on projects left in the lurch and, at the same time, work ahead on some big projects that are due in the next couple months. I feel a bit like a dog chasing its tail. 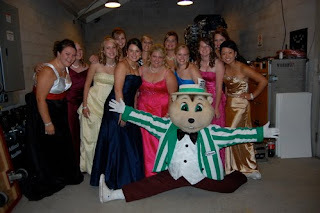 I spent an evening in St. Paul at one of my all-time favorite events, the Princess Kay of the Milky Way coronation. 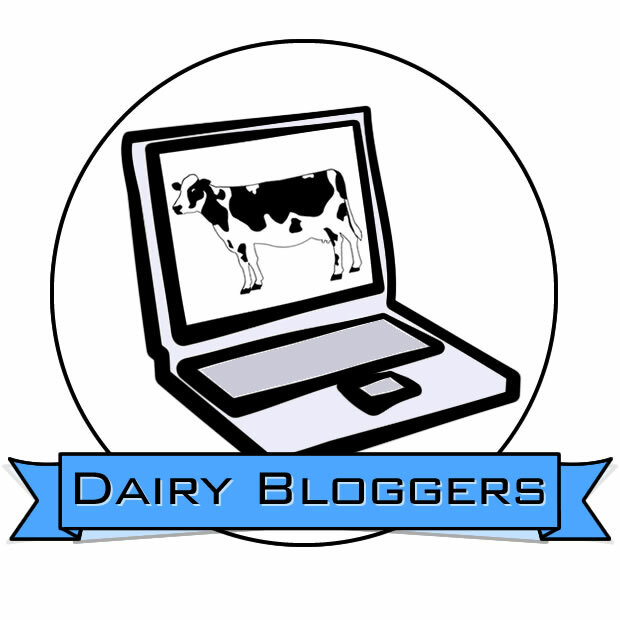 I love seeing the enthusiasm for the dairy industry and feeling the anticipation in the air as the new Princess Kay is crowned. This year's coronation was unique, though, because I was backstage most of the time, taking photos for the Dairy Star. I got to see all of the nervousness and excitement that the candidates channel into poise and polish for the audience. I found myself remembering my own experience as a Princess Kay candidate 10 years ago. 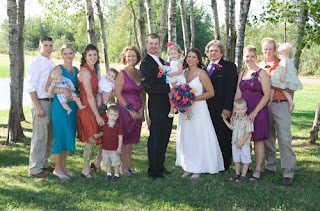 We took a couple days off and went up north for my little sister's wedding. 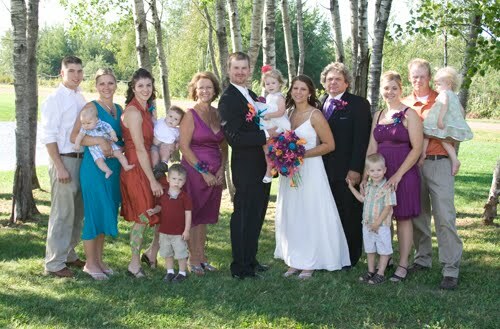 Other than Monika being sick (she threw up twice on Glen), the wedding was a blast. We wrapped our fourth crop of hay. This photo was actually from third crop. I forgot to take my camera out to the field. For fourth crop, we tried something new — wrapping two big squares stacked on top of each other. It looks like we built a fort wall out in our field. We made our annual trek to the Minnesota State Fair. Thankfully, we picked a cool, quiet day to go. It did rain once, but we were inside the DNR Building when it started so we didn't get wet. 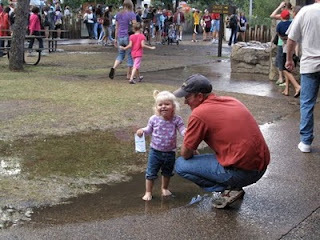 Glen let Monika play in the puddle after the downpour stopped. Dan was still inside with Papa, checking out all of the wild animals in the Wildlife Wing (Dan even plugged his nose when he spotted the skunk). We started chopping corn. We filled the little silo and two bags. We'll fill the big silo sometime next week, weather permitting. So far, the corn silage looks great. With the whirlwind that has been the past couple weeks finally winding down, life is normalizing. We even dried up a big group of cows, so we're not switching cows right now. The reprieve won't last long, but I'm enjoying it while it lasts. What I'm enjoying even more, though, is the blank September calendar page. Hopefully that means we'll have fewer where-did-the-day-go days.